Thursday August 26th 1897 I got our breakfast and did up our dinner ready to go to the fair again. ate with the Woolfs. Spent the day very much like yesterday. came home in good time. Ott brought Edith and Nellie to the fair in the afternoon. Friday August 27th 1897 I dried more corn, put up plums and tomatoes and made plum butter. It kept me at it all day. Aunt Ellen was here all afternoon and she & Mollie for supper. Saturday August 28th 1897 We did up our work and took the butter up town. I was up to Ashleys to see about a dress I am going to have made. Will and I drove over to the depot to see Ida & Nellie and Mr & Mrs Peckham start away. I stopped at [Kosnes?] and got my new dress. We went over home for dinner. It looked so much like rain we did not stay long. Lee is miserable. I talked with him about having a doctor and he seems very much discouraged about himself. Did evening work after coming home. It only rained a little but blew pretty hard in the valley. 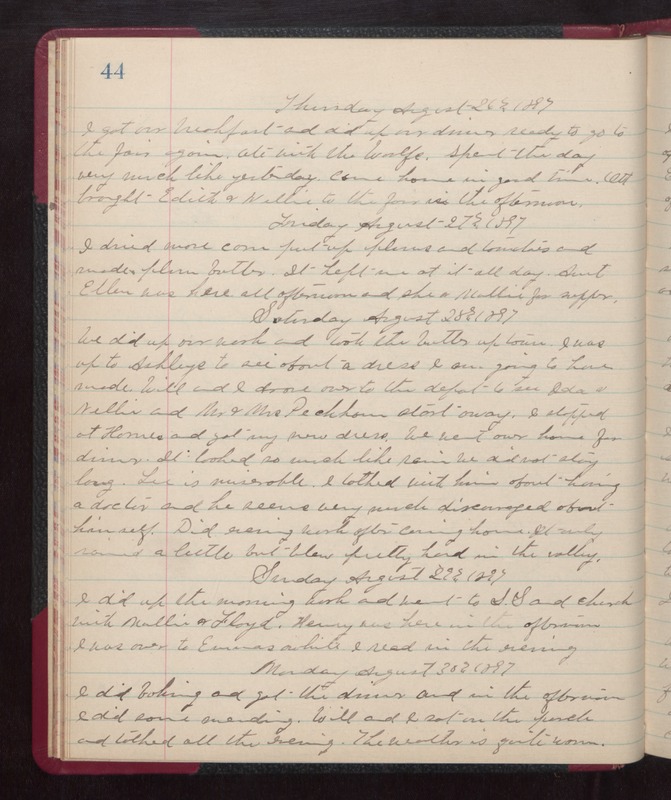 Sunday August 29th 1897 I did up the morning work and went to S.S. and church with Mollie & Floyd. Henry was here in the afternoon. I was over to Emmas awhile. I read in the evening. Monday August 30th 1897 I did baking and got the dinner and in the afternoon I did some mending. Will and I sat on the porch and talked all the evening. The weather is quite warm.